This article is the third and final one in my series about Financial Advisors. If you read the first two, you hopefully have a better understanding of what advisors do, where they do it, and how they are compensated. So in this article I am going to cut to the chase: Do you need an advisor, and if so, how do you choose the right one for you and your situation? 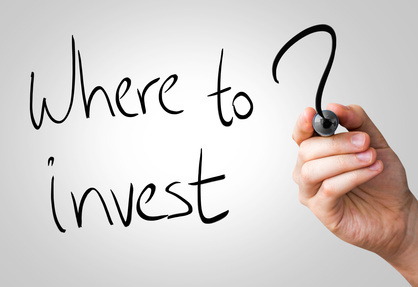 To start with, if you want to save for retirement outside of a 401k/403b type account, or want to transfer your savings from one of those accounts to an IRA, you will need to choose a company to hold your assets for you. (Unless you use First Mattress Financial, of course, which I don’t recommend). The company could be a bank, mutual fund, brokerage firm, insurance company, or investment management firm. For example, I currently use a Fidelity brokerage account for my IRA. A lot of people use a company they already have a relationship with. For many, that’s their friendly local bank, or perhaps their insurance company. (USAA is my insurance company, and they offer all kinds of financial services in addition to insurance. They have one of the top-ranked online-only banks in the U.S.) But that may or may not be the best thing to do. In some cases, financial advisory services are adjunct “me too” functions that are not a major business for the bank. They are offered through a smaller division of the bank or a third party. Larger banks (regionals and nationals) tend to have more focus and depth in this area, especially the Wall Street banks. Personally, I like Fidelity, Schwab, TD Ameritrade, and USAA for brokerage services. TIAA and Vanguard are worth considering, especially if you mainly want their products, which are very good. Other good online brokerages are E-Trade and Ally Invest (used to be Trade King). Nerdwallet has an excellent article rating the more prominent online brokerages. Once you choose a company, you have to make another decision: whether to hire someone to manage your money. This verse stresses the need for good advice and from more than one person. So, before making any major financial decision, especially how to invest your retirement savings, you would do well to talk to several people, including some who don’t make their living by selling the very investments you’re thinking about buying. And most importantly, you want to talk to those who you believe will give you honest, wise, and Godly advice. You could, of course, go the do-it-yourself (DIY) route. I think that is a great way to go for many people much of the time. That’s because no one cares about your success in managing your money as much as you do. You are the one who worked hard and saved. And with a little time and effort, you can manage it yourself. But it isn’t for everyone. If you are just too busy (or just have other priorities), or have absolutely no interest, or tend to be “emotional” when it comes to investing (many people are), or you have a tendency to act on impulse, you would probably be better off with an advisor. If you decide to DIY, you have to be willing to devote some time to learn investing basics and how to choose the right investments for your goals and risk tolerance. You will need to gather some information and guidance about investing from sources that you trust. Complex decisions may necessitate meeting with a professional advisor no matter what. And most importantly, once you come up with a plan you need to stick with it – and that can be the hard part, especially when things get rocky. There is much to be learned from many of the experts in the field of investing. I have learned a lot about investing from fellow believers like Larry Burkett, Howard Dayton, Ron Blue, Matt Bell, Austin Pryor, and Dave Ramsey. However, I also follow a few “secular” experts in the field like Jack Bogle (the founder of Vanguard), retirement experts Wade Pfau and Steve Vernon, investment manager Paul Merriman, and authors like Ben Stein and Tim Maurer. If you don’t want to manage your investments, you will have to hire a financial advisor (either a human or a robo-advisor). You can choose based on the person or the company, but most of us know more about the companies than we do the advisors who work there. Lets talk about companies first as you’ll need to do business with one either way. Many of the companies I have cited previously offer individual financial advice and portfolio management services, and in most cases, a relationship can be set up to minimize conflict of interest if you are careful to do your homework. But keep in mind, there will almost always be costs involved as we saw in the last article. I mentioned that I use Fidelity Investments for my IRA. It is a brokerage account. However, I don’t currently have any Fidelity products in my IRA. (Fidelity has a ton of great products and I have owned them before; I just don’t have any right now.) If I wanted to, I could choose to work with a Fidelity Financial Advisor. If I wanted comprehensive financial planning services, I could get that from Fidelity as well, but I would probably go to Ron Blue Trust, a Christian Financial Planning and Advisory firm, or another local Christian firm that employs experienced Certified Financial Planners. Using Fidelity as an example, the graphic below shows the full range of advisory services I could choose from if I wanted to work with them. 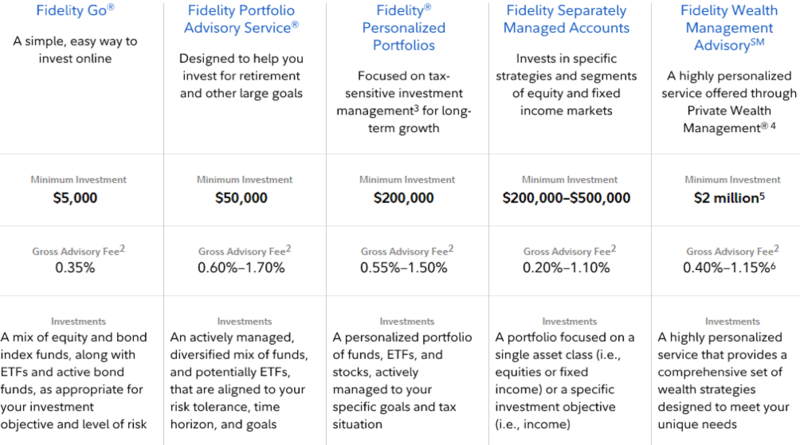 (By the way, “Fidelity Go” is their equivalent of a Robo-Advisor service – not surprisingly their lowest cost option.) Other companies like Vanguard and Schwab offer similar services. As you can see, the more you have to invest, the more sophisticated the services become. Fidelity’s fees are generally in line with the industry as a whole. The challenge I would have in working with Fidelity (or any other financial firm) is how to choose a specific advisor. I wouldn’t just do business with whoever happened to answer the phone. I would want someone who is competent, knowledgeable, and experienced – not someone just out of college who just passed a couple of licensing exams (although those are important). So how would I determine competence? An advisor’s certification may also be informative. The CFP credential is considered by many to be the “gold standard,” but the training for it is very broad and does not go extremely in-depth in retirement planning and investing, retirement income withdrawal strategies, etc. So, just because someone is a CFP does not mean they are an “expert” in any particular area. Again, it comes back to experience. When it comes to personal finance and investing, the Bible puts wisdom at the forefront. I would want an advisor who is wise and prudent about money and life. That pertains to their finances, which is not something you are going to read on a website or resume’. I think advisors also have to care about your long-term success and would be willing to compromise their short-term benefit to achieve that. Many strategies and decisions take years to pan out, so you need someone who is in it for the long haul, not just to make a quick commission. Before you make a decision, try to get an idea of what their advice might look like. Is it understandable or full of jargon and complex “financial-speak?” Do you understand the why and not just the what of their recommendations? Are they a good fit for your particular situation? Could you explain them to your spouse? You also need to make sure you are getting the best recommendations for you, not ones that the advisor has a personal financial stake in (this is the conflict of interest problem). That’s why, generally speaking, I would say to be careful choosing an insurance agent or stock broker as your advisor. They may be great people, but they are first of all salespeople, so giving unbiased advice may not be their priority. Finally, if you are older and nearing or in retirement, you need to work with someone who can help you with the things that are especially relevant to that stage of life – like Social Security, estate planning, retirement income distribution, etc. Friends and family. Many of us have a friend or relative who is a financial advisor. They may be great at what they do, but as a general rule, I’d look elsewhere. Financial advising and close relationships don’t mix. If the market drops and you lose your shirt, you run the risk of losing a close relationship as well. There’s nothing wrong with listening to your friends’ or relatives’ ideas. They may have some great suggestions for you. They may even be in a situation that is very similar to yours. You can hear them out; just don’t let them manage your money. Better to have someone who can be totally objective. Your friend or relative’s “guy.” Have you noticed that lots of people have “a guy” and many of them want him to be your “guy?” Recommendations can be a great place to start, but don’t be too quick to choose an investor based on someone’s recommendation alone. Do your homework since you may not know for sure how closely your friend or relative is paying attention to what their “guy” is doing. People who sell financial products. As a general rule, I would shy away from advisors whose primary mode of compensation is from commission sales. Many people believe that financial advisors are legally required to act in their best interest – the “fiduciary standard of care.” However, selling financial products on commission can create a conflict of interest because some financial professionals might suggest products that are better for them than for you. This is particularly true of investment brokers and insurance salespeople who are almost always paid by commissions. People who offer “secret” or “proprietary” investing ideas. We all know the adage, “if it sounds too good to be true then it probably isn’t.” Steer clear of people who claim to have the “secret sauce” because they have somehow managed to tap into hidden or proprietary ways to grow your money faster than others. If you’re older, you’ve probably received an invitation on some fancy stationery inviting you to a free dinner at a trendy restaurant where you can hear about how the system is about ready to fail, and everyone’s investments will be worthless. Of course, you’re also going told about the only solution available to you, which few others know about, that can protect you from ruin. Then you find out that it is a variable annuity with high complexity and high fees that would require a day just to get through the prospectus. People with big-name firms, just because of the big name. Many of the well-known firms have great products and services. (I listed some of them earlier.) But don’t use an advisor with them just because of the firm’s reputation. You are choosing a person, not an entity. You’ll need to do your homework just like you were interviewing an advisor at a small firm. Don’t assume that someone is a great advisor just because they work for a great company. This is an important decision, so take your time. There are a few other things you can do to make sure you get the advisor that is right for you. Research them on social media (Facebook and LinkedIn), FINRA’s BrokerCheck, and read all the information on the advisor’s firm’s website. As I suggested earlier, look for the CFP (or ChFC) credential, but that is not the end-all. You want to get full disclosure from them of the products they recommend, why they recommend them, and how the advisor is paid. Bottom line: you want someone who is competent and whom you can trust. But you also need to pay attention to costs. You will only gind that kind of advisor by doing your homework.